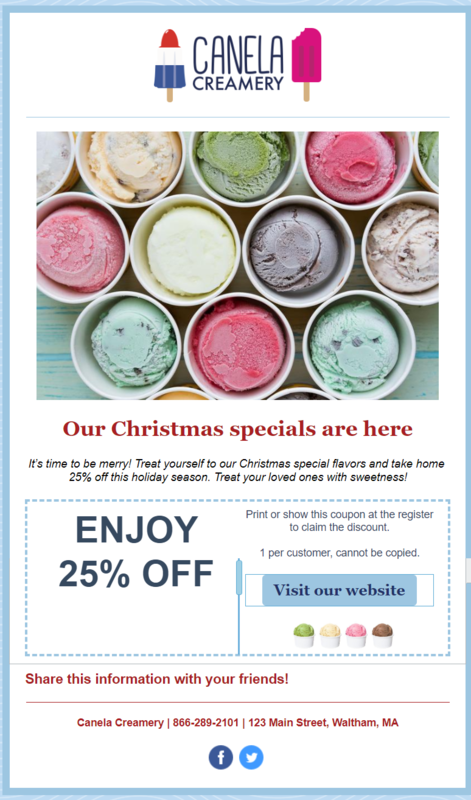 ﻿ Four Essential Templates to Jumpstart Your Email Marketing » Red Mango Marketing! Email marketing provides an opportunity for businesses to create a bridge of communication with their customers. Sending valuable information and updates, tailored to meet personal needs right to their inbox, is a surefire way to get noticed and do more business with them. The key to writing a marketing email is to follow the 3 Cs — Clear, Concise and Compelling. But how do you write powerful emails? How do you write the right message? 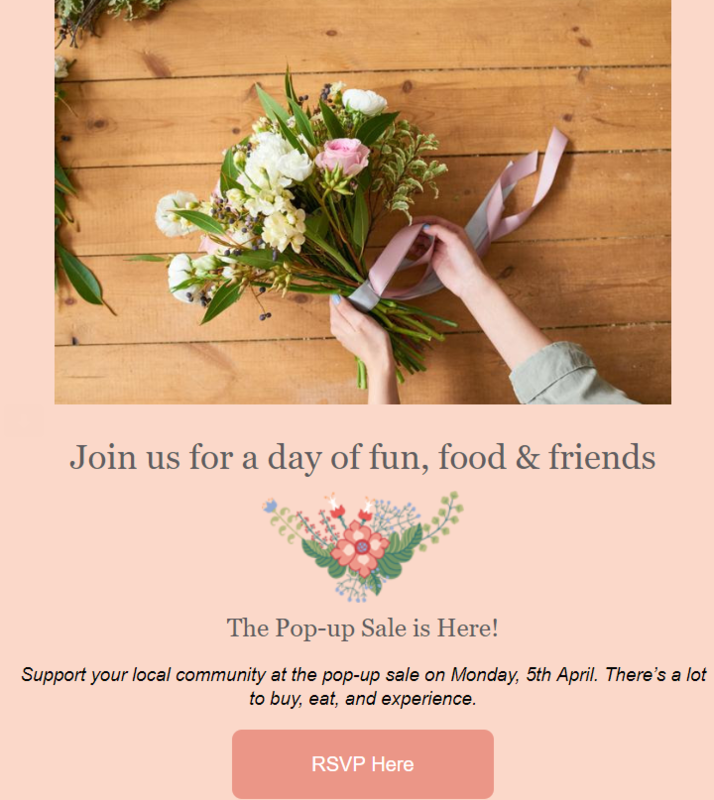 How do you make each email stand out, and drive action? Writing strong emails is not always easy, especially when you are sending out emails regularly (which is what you must do!). If you are like the many small business owners and marketers looking for ideas and inspirations on how to write effective emails and are constantly asking yourself, ‘What do I write in my emails?’ — we’ve created some great examples to get you started. Marketing emails allow you to maintain an ongoing relationship with your customer. 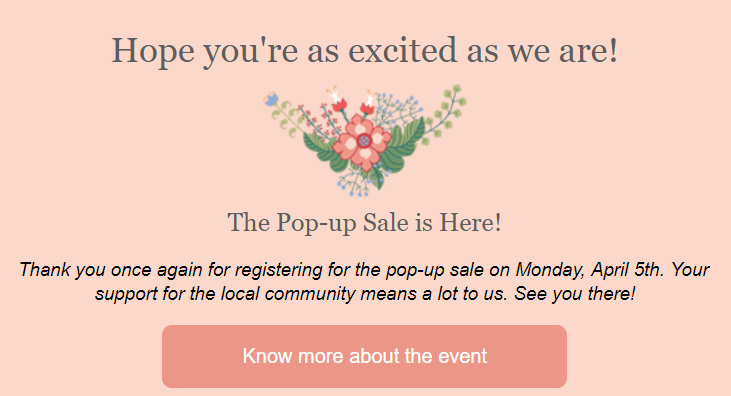 The four email templates that you definitely want to include in your email marketing calendar are: a Welcome email for when someone joins your list; an Invitation to Connect on social media channels; an Event Invitation series that you can customize throughout the year; and a Holiday email that you can use to send greetings and appreciation to your customers. To get started, build a master email template for your brand that includes your logo, your brand colors, and matches all your marketing assets. Then use the content ideas below to fill them in. The most important thing to keep in mind is that the welcome email you send must always fulfill the incentive you promised. In addition, you can use this email to introduce your business, your products and services, and you can set expectations with your new subscriber about what type of information they will get and often they will hear from you. 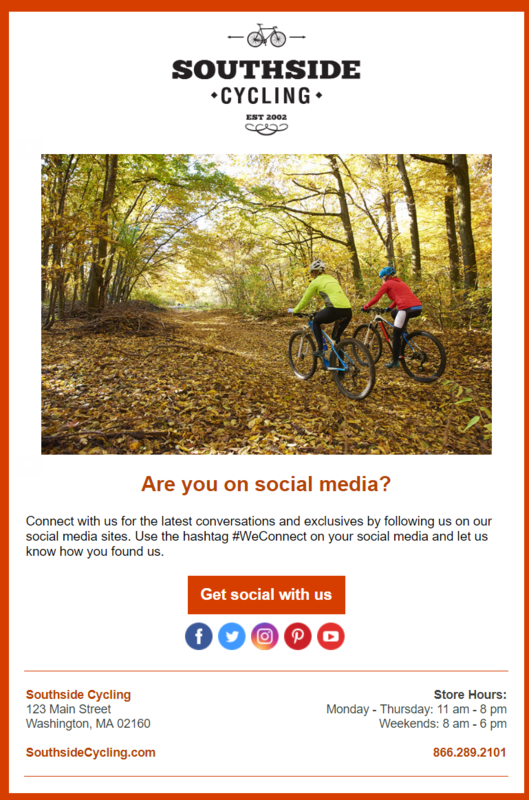 You can personalize the invitation to connect by adding all the ways customers can connect with you. Let them know which social channels you are available on, your physical address, phone numbers, customer support email information, and any other way a customer can reach out and connect. This demonstrates that your business is willing to connect and communicate, whenever and however a customer wants. 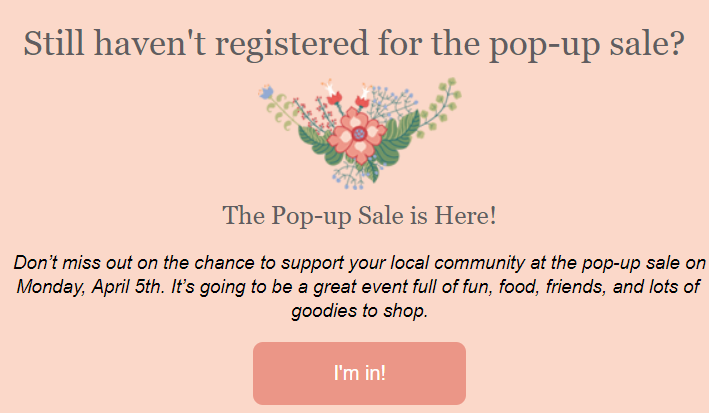 Whether you’re hosting an event online, like a webinar or a Facebook live chat, or offline like a pop-up sale or a business conference, you can use email to invite people, and get RSVPs to boost attendance for the event. 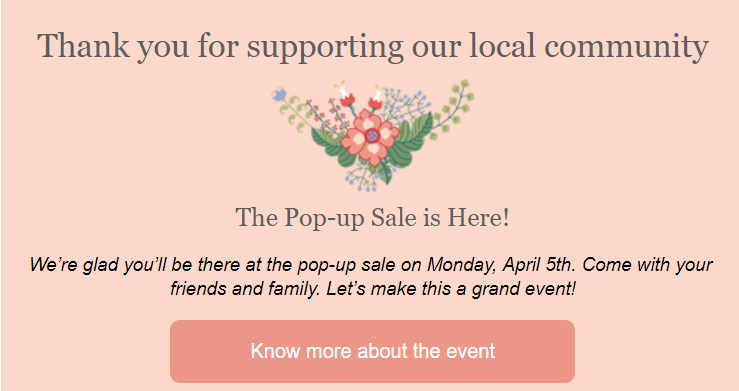 Promotion for an event is typically broken down into a three-email series — the first invite, a sneak-peek, and a reminder. The second email could also include images from previous similar events, a trailer video, or snippets from social media conversations around the event to generate curiosity. The objective of the event email series is to tell what the event is about, generate some excitement, and create a sense of urgency for people to attend. Email marketing allows you to stay in touch with your customers and offer them relevant and personalized content. Thinking about all the types of emails and messages might seem overwhelming. Relax. We have done the work for you. 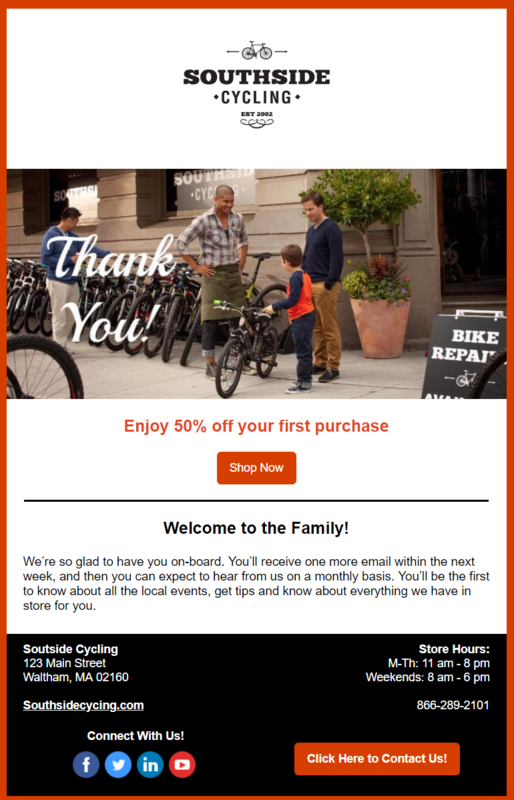 You can use the templated email examples above to build out your marketing campaigns. Send welcome emails and an email that invites customers to connect on social media channels to build a long and fruitful relationship. 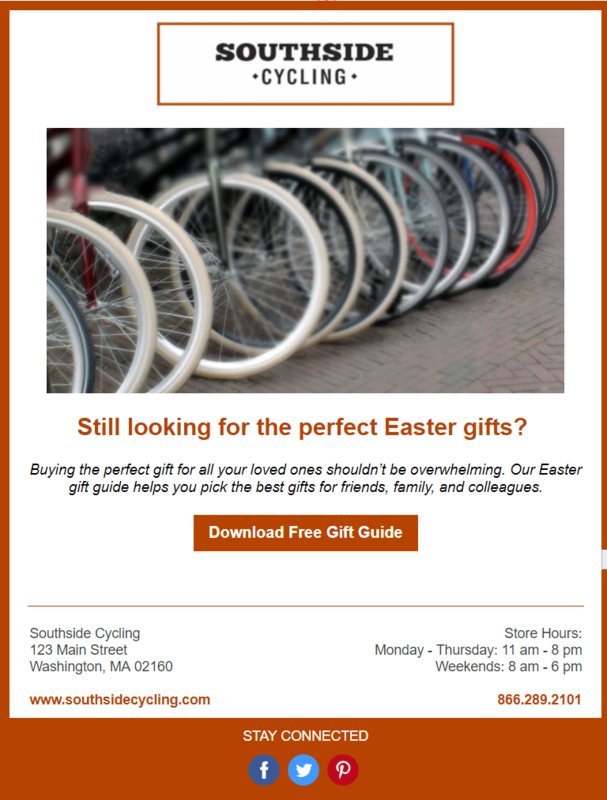 Use emails to offer free downloadable guides, ebooks, or other relevant content to show your customers the value of receiving your emails and staying in touch. Host online or offline events is another good opportunity to offer more value to your customers, generate revenue for your business, and bring people together to learn more about your organization. Send a three-email series to introduce the event, generate curiosity, and boost attendance for your events. Finally, use email to maximize holiday excitement throughout the year and boost sales and engagement for your business. Start creating clear, concise and compelling email content that inspires action, and builds communication with those who matter the most — your customers. 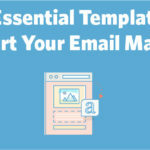 The post Four Essential Templates to Jumpstart Your Email Marketing appeared first on Constant Contact Blogs. 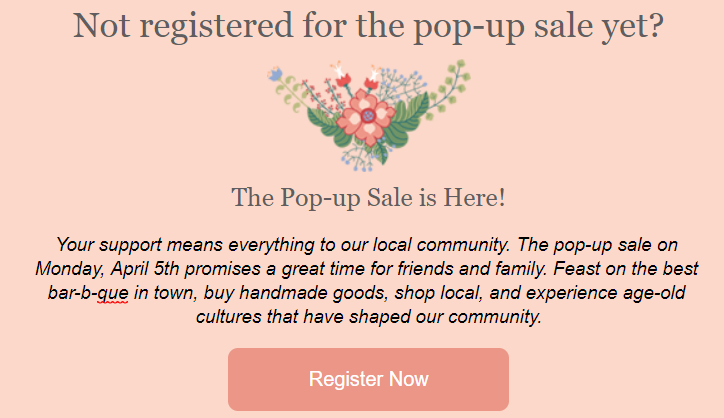 This entry was posted on Tuesday, April 16th, 2019 at 8:00 am	and is filed under Email Marketing, News & Updates. You can follow any responses to this entry through the RSS 2.0 feed. Both comments and pings are currently closed.